The results of decades of research shows that children and adolescents encounter challenges and obstacles in searching for information and retrieving relevant results, and have difficulty interpreting results within various information environments. However, a recent paradigm shift points to the changed information behavior of the new generation of users; children and adolescents born after the advent of the Web. Technologically savvy, they skim and surf for information, multi-task, search collaboratively, and share information on social networks. This book comprises innovative research on the information behavior of various age groups and special populations. 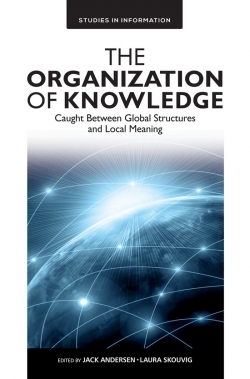 It provides studies and reflections on designing systems that help the new generation cope with a complex knowledge society. 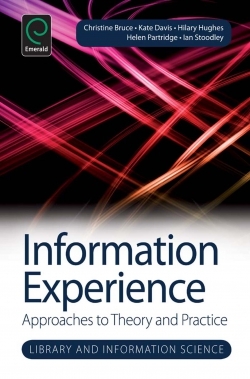 In addition to information scholars, this book will also be of interest to information professionals, librarians, educators, Web designers, and human-computer interaction researchers. Depicting the Intersection between Information-Seeking Behavior and Information Literacy in the Research Process: A Model. New Directions in Children’s and Adolescents’ Information Behavior Research. Library and Information Science. New Directions in Children’s and Adolescents’ Information Behavior Research. Copyright page. List of Contributors. List of Reviewers. Editorial Advisory Board. Use of Touch Devices by Toddlers or Preschoolers: Observations and Findings from a Single-Case Study. Social Capital and Academic Help Seeking: Late Adolescents’ Use of People as Information Sources. Young Girls’ Affective Responses to Access and Use of Information and Communication Technology (ICT) in Information-Poor Societies. Designing an Intervention Tool for Students with Students. Index. InfoMe: A Field-Design Methodology for Research on Ethnic Minority Youth as Information Mediaries. Perspectives of Rural Librarians about the Information Behaviors of Children with Special Needs in the Southern and Central Appalachian Region: An Exploratory Study to Develop User-Centered Services. The Social Information Grounds of M?ori Secondary School Students. A Failure to Connect: The Elusive Relationship between Broadband Access and Children’s Information Seeking in American Academic Research. Interface Design: The Impact of Images and Catalog Organization on the Information Retrieval of Children Ages Five to Eight While Subject Browsing. Introduction. Depicting the Intersection between Information-Seeking Behavior and Information Literacy in the Research Process: A Model. New Directions in Children’s and Adolescents’ Information Behavior Research. Library and Information Science. 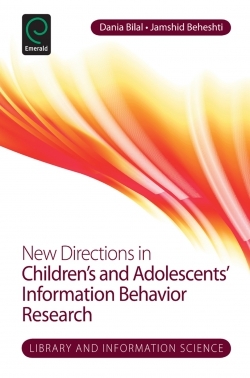 New Directions in Children’s and Adolescents’ Information Behavior Research. Copyright page. List of Contributors. List of Reviewers. Editorial Advisory Board. Use of Touch Devices by Toddlers or Preschoolers: Observations and Findings from a Single-Case Study. Social Capital and Academic Help Seeking: Late Adolescents’ Use of People as Information Sources. Young Girls’ Affective Responses to Access and Use of Information and Communication Technology (ICT) in Information-Poor Societies. Designing an Intervention Tool for Students with Students. Index. InfoMe: A Field-Design Methodology for Research on Ethnic Minority Youth as Information Mediaries. 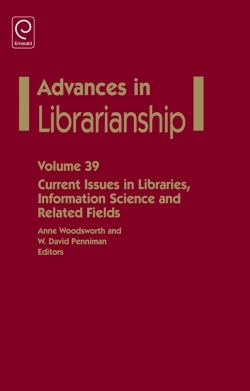 Perspectives of Rural Librarians about the Information Behaviors of Children with Special Needs in the Southern and Central Appalachian Region: An Exploratory Study to Develop User-Centered Services. The Social Information Grounds of M?ori Secondary School Students. A Failure to Connect: The Elusive Relationship between Broadband Access and Children’s Information Seeking in American Academic Research. Interface Design: The Impact of Images and Catalog Organization on the Information Retrieval of Children Ages Five to Eight While Subject Browsing. Introduction.